Our children are bombarded by media advertising messages everyday – on TV, at the movies, on DVDs and videos, on the internet, in magazines and even children’s books. If tossing out the TV and shutting down the home computer seem like the answer to eliminating children’s exposure and desire for goods they don’t need, it probably isn’t. Although we’ll all agree that limited TV and computer time with more outdoor physical activity would benefit all our children and us, it won’t protect our children from advertising messages or give us the opportunity to teach our children how to be educated consumers. Even children who do not watch TV are exposed to advertising on their clothes, their toys and even the shopping carts they ride in at the grocery store. It’s no wonder that advertisers are targeting children. Children either spend or influence $500 billion worth of purchases a year, says the National Institute on Media and the Family. In the past, the most effective way to sell children's products was through us, the parents. Now, the opposite is true — children are the focal point for intense advertising pressure seeking to influence billions of dollars of family spending. 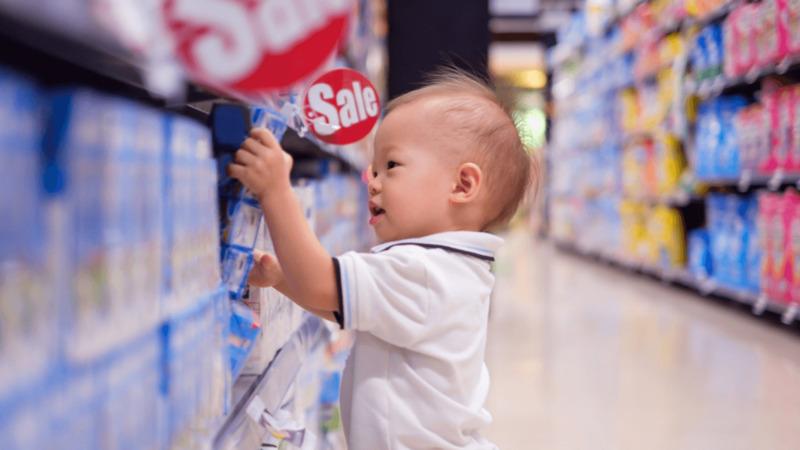 Children as young as three-years-old recognize brand logos, with brand loyalty influence starting at age two. Advertisers are aware that children influence the purchase of not just kid's products anymore, but everything in the household from cars to toothpaste. Thus these "adult" products are being paired with kid-oriented logos and images. Magazines aimed at children have blossomed. Many of these magazines are kid versions of adult magazines. For instance, the popular publication Sports Illustrated for Kids carries ads for minivans. If we can’t escape the advertising blitz, what can we do? Talk to your child about purchases before you enter a store. Have a list of what you plan to buy when you go to grocery or superstores. Before you enter the store, remind your children that these are the only things you are buying. Say “no” to impulse buys. It’s easy for tired, busy parents to say “yes” to our children’s pleading, demanding and begging for stuff they want. And although “giving in” may momentarily stop their requests, keep in mind that two things will happen. One, your child will learn that persistent demands gets results, and two, enough, is never enough. We parents forget that our children’s wants can never be satisfied. There will always be something “cooler” right on the next aisle. Don’t try to keep up with the Joneses. In fact, there is no need to keep up with the Joneses because they died of exhaustion. Your children don’t need to have something just because someone else has it. Limit TV time and watch with your children. Young children are not able to distinguish between commercials and TV programs. They do not recognize that commercials are trying to sell something. Have your children earn and save money. It is always easier for children to spend someone else’s money, like ours. Have your child save for a particular item they want. Create spending limits. Hey, we work hard and it feels good to buy things for our kids. When you do let your child purchase an item, consider giving them a dollar amount, or at the grocery store, let your child choose just one thing. Help them make choices. Examine your own spending habits. Children learn by watching us. How do we spend our money? How do we save? How do we respond to advertising? Is the media bad for our children? Probably not, but in some ways it can be misleading, and too much of anything isn’t good for our children — or us. The news usually focuses on negative, sensational spots often giving children an unrealistic sense that the world is a much more scary and menacing place than it really is. War is catastrophic and terrorism is frightening, but the reality of our children’s day-to day lives in America is relatively safe. And there are good, educational shows on TV. Imagine life without a computer or the internet? The internet is a vast library of fascinating information for our children right in our own homes. Many organizations, like Common Sense Media, believe that media is fun and educational and are focused on making media producers accountable to families and urging them to invest and promote programming that serves the interests of our kids. Studies have shown that children who watch carefully constructed educational programs that are aimed at their age level, such as Sesame Street, do better on pre-reading skills than children who watched infrequently or not at all. But before you let your child spend endless hours watching TV, consider that these same studies further show that children who watch cartoons or other purely entertainment television shows during their pre-school years do poorer on pre-reading skills. So, it’s not whether our children watch, but what and how much. Take a look at the tips below for some ideas that give you and your children control over TV. Watch What Your Kids Are Watching - Be aware of program content as well as the content of the daily news. The younger the child, the more impressionable he or she is, and the less experienced in evaluating content against the values of family and community. Additionally, emotional images may frighten children. Set Some TV Guidelines - Have a conversation with your children, but reserve the final decision. Make the rules clear, like no TV before school or until homework is completed. Setting new limits may be upsetting to and difficult for your children at first. Make a TV Schedule - Go through the TV guide in the paper on Sunday and make family decisions on shows to watch for the week. Discuss reasons for the decisions with your children. If in doubt, get more information. Ask your Children Questions about What They Are Watching - Ask what they see. It may be very different from what you see. Ask them to tell you what things mean to them. Ask them why they watch specific shows, what characters they like and don’t like. Discuss the commercials and their perception of toys, cereals and other products. Talk to your child. Share stories and activities from each family member’s day.